For the next several weeks we will explore the topic of authenticity. I will be sharing tidbits of my upcoming 10-week workshop series: Journey to Authenticity. Did you miss last weeks article? View it – here. Part of living an authentic life is being able to clearly state yes and no when we need to. Making choices and decisions can be challenging. Yet it is something we have to do every single day of our lives. Being clear is critical in avoiding conflict and misunderstandings. Strong relationships are built on respect, honesty, and clarity. Saying YES – when you want to, when it ‘feels’ right inside of you; not because you feel obligated, guilty or coerced. Feel the yes inside your body. Say yes to your needs being met and honoured. Trust your intuition and gut instinct with all your yeses. 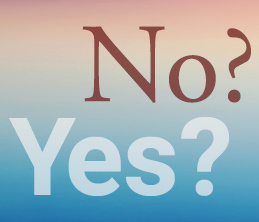 Saying NO – when you want to, to set a clear boundary, when it is your absolute truth. NO is one word, two letters and a complete sentence. There is no need to explain your reasoning. Please let go of making excuses or offering white lies; there is no integrity in living that way. It will tarnish your respect for yourself and there is an energy that can be felt when we act this way. Remember you are precious and so is your time. We often feel uncomfortable saying what we really want to; the truth. We feel badly because we are taught it is more important to fit in and be liked than to follow our inner directive, intuition and instincts. When we are clear with our decisions, others will trust us. When we say what we really mean we also learn to trust ourselves. Honour your truth in all areas of your life and stay firmly rooted in your authenticity. The result is a life lived in complete alignment with your highest good. “There will be very few occasions when you are absolutely certain about anything. You will consistently be called upon to make decisions with limited information. That being the case, your goal should not be to eliminate uncertainty. Join me for the 10 week series that begins on January 24, 2019.